The “show-stopper moment” came as the meeting opened, he said, when Cardinal Daniel N. DiNardo of Galveston Houston, the president of the U.S. Conference of Catholic Bishops, announced the Vatican had asked that no vote be taken on several abuse-related protocols governing bishops behavior and accountability that he had hoped would be accepted during the three-day meeting. He also referred to allegations that retired Archbishop Theodore E. McCarrick, former cardinal and former archbishop of Washington, abused a minor decades ago and has engaged in sexual misconduct with seminarians. The 88-year-old archbishop denies the claims. Archbishop Etienne acknowledged that many have questioned how the prelate could rise up the ranks of the church to become a cardinal. “A motion was made during our meeting to encourage the Holy Father to release documents related to this case. This motion ultimately failed because after considerable debate, we recognized that the Holy See in October already made such a commitment,” Archbishop Etienne explained. He added that “it is important for the people in the pews and the public to know” that investigations “are now underway” into claims made against the prelate and into how and when church leaders were aware of these claims even years ago. “We will simply need to remain vigilant in awaiting the public disclosures, and should it become necessary at some point in the future, to push for the publication of their findings,” Archbishop Etienne said. He said he is well aware people are asking where the voice and input of the laity, especially of women, are in this process. On the national level, the National Advisory Committee is made up of lay men and women “who give valuable counsel to the bishops,” as well as the National Review Board, whose members “give strong recommendations to the body of bishops through the Committee for the Protection of Children and Young People. “On the global level, there are more and more women holding offices in the Roman Curia and serving in various consultative bodies,” he said adding that several women have just been appointed to help with preparations for the February summit. “Granted, there is room and need for more of these voices, but they are present,” Archbishop Etienne said. He added: “In short, his message to us is ‘No to clericalism’ and ‘Yes to service.’ ‘No more abuse of power.’ We are to reject all desire for power, pride and privilege. 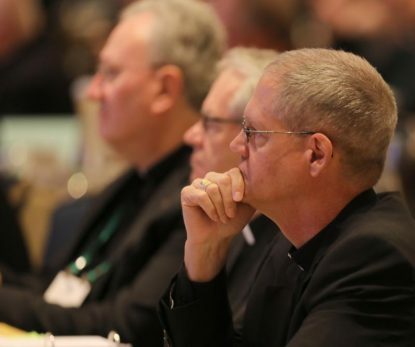 “There is a need for the universal church to recognize that this issue of clergy abuse is a universal problem, and it is now time to address it from a universal perspective,” Archbishop Etienne said, noting that this is why the people “have taken the unprecedented step” of convening the February summit. He also praised the pope for requesting that all the of the U.S. bishops make an eight-day spiritual retreat together to pray and reflect on the important matters facing the Catholic Church. It is set for Jan. 2-8 at Mundelein Seminary near Chicago. The pope sees the abuse crisis as global problem but also sees the need for bishops “to look beyond policies and procedures — to go much deeper — to the core of the problem, which is our own personal, fundamental need for interior conversion,” Archbishop Etienne said.